Fortunately, I remembered I had about four ripe avocados hangin' out in Big Bowl, courtesy of my local Safeway's killer sale on Haas avocados recently. At just $0.77/each, how could I resist, right? It took some work to get the right ones, since they were either too green or too ripe (bordering on spoiled). I chose the ripest of the green ones and let them ripen slowly until they were just perfect and ready to use in My Favorite Avocado Salad or any number of dishes (in my book, avocados can do no wrong). But this time around, I actually had the rest of the ingredients for guacamole, so I figured I'd whip up a fresh batch and make an old standby omelette that I'm surprised I haven't posted here yet: the Guacamole Omelette. There are several omelette recipes that use guacamole as a topping or main ingredient, so this is not some new omelette-rocket-science recipe. However, many guac-omelettes or guac-scrambled eggs throw cheese into the mix, and while that's tasty, it also makes the dish much higher in fat. Even for a cheese lover like me, the combination seems to be too rich. This omelette cuts back on the bad fat and just leaves the good, healthy fats from the avocado, and is every bit as hearty & tasty as those using cheese. While I like to make my guacamole from scratch, if you're pressed for time or out of an essential ingredient, feel free to mix some prepared salsa with your avocado for a fast "cheater guac". Other than that, there's not much to note! This is a quick, tasty omelette you can enjoy for brunch or breakfast-for-dinner, and if you keep an eye out for those avocado sales, it's wonderfully affordable to boot. Cut the avocados in half, remove the seed and peel. Dice into large chunks, then combine with the rest of the guacamole ingredients in a medium bowl and mash together with a fork. Check for seasoning and adjust according to taste. Set aside. Beat the eggs together in a small bowl. Heat the butter or oil in an omelette pan over medium high heat. Add the eggs and swirl the pan around until the egg is evenly distributed. Cook until the omelette is set and there is only a small amount of unset egg left. Remove from heat and allow the residual heat from the pan to finish setting the omelette. Spoon the guacamole onto one half of the omelette and fold over the other half. Slide onto a plate, garnish with salsa & sour cream if desired, and enjoy! Love this recipe! Great thinking. 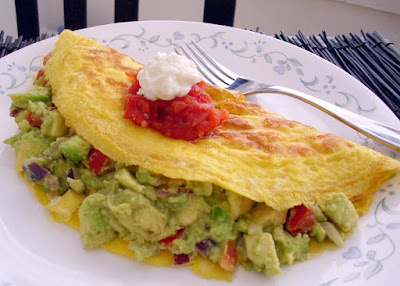 I wish I had an avocado to make a Guacamole Omelette right now! Looks great! Holy cow, that looks delicious! I love the avocados-instead-of-cheese trick. Love guacamole! I'd like to find something it doesn't go well with. Yay! What a a great combination :-) I always love breakfast for dinner! I heart omelettes with avocado, so why wouldn't I love them with guac?!? Great idea! Next time you've got ripe avocados in the Big Bowl but aren't ready to use 'em, put them in the fridge. The ripening will slow almost to a stop, and get you another week or so before they are too squishy. That is a great idea and timely! I was just lamenting that I didn't go to the grocery store today. What to fix for breakfast with what ingredients I DO have? Now I know and thank you again for coming to the pantry rescue! That is like my breakfast heaven right there! 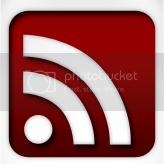 New to your blog, following you on Twitter! Love anything with avocado's. Looking forward to reading more of your blog posts. Looks tempting!! With this kind of recipe, you will not look at eggs the same way again! An omelette may appear common to you but what makes it extraordinary is the flavor and taste that other varieties give so that we can enjoy eating them for breakfast.